We want to be your go-to Rover resource! We pay close attention to our furry guest’s needs. Our pet shop’s goal is to enhance their well-being. We also work closely with other pet professionals and companies who endorse proper pet care and wellness. Based on the intimate relationships we have with our client community, we have approved these select pet products for your dog and cat’s health and wellness. 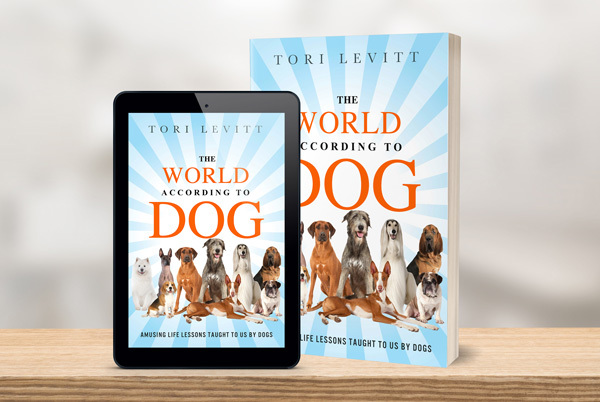 In The World According to Dog: Amusing Life Lessons Taught to Us by Dogs, Tori Levitt draws on her 10 years of experience living with a myriad of dogs—all breeds, ages, sizes and dazzling personalities. In a witty and enlightening read, she highlights the supernal nature of dogs and our unique bond with them. Woven within these pages are revelations drawn from scientists and animal behaviorists alike with entertaining ideas and tips for improving your personal human-dog relationship. The World According to Dog answers many questions about why dogs do what they do. These heart-warming tales illuminate the perennial love of dogs and their fierce alliance to us; despite our frailties. Through the eyes and heart of a dog, we can learn how to be less human and more humane. There’s a hidden treasure inside each dog, just waiting to be unlocked through inspired listening to their unique language. Discover other hidden surprises inside this one-of-a-kind book geared for the human who wants to be the best dog owner they can be. Canna-Pet is committed to providing pet owners with organic, ethically-sourced products to help their beloved companion’s live healthier, happier and longer lives. Founded in 2015, HempMy Pet is a hemp oil production company using strictly organic farming methods, creating only the highest-quality human grade formulations for pets; made in the USA. They grow their own hemp and handle the entire process from “seed to sale", using only one type of hemp grown specifically for its medicinal properties. King Kanine's mission is to promote pet wellness inside and out; by providing owners with the highest quality organic CBD products for pets available on the market, bringing joy to families nationwide. Healthy Paws Pet Insurance covers everything that matters, including injuries, illnesses, genetic conditions, emergency care with unlimited life-time benefits. Get a free quote and Healthy Paws will donate toward a homeless pet’s medical care. Healthy Paws cares about your pet’s health and homeless pet’s too! Curious about pet health insurance? Check out Embrace Pet Insurance for a FREE quote and more information. All of your pet’s unexpected accidents & illnesses are covered with Embrace’s one simple yet comprehensive pet insurance plan. Personalize your policy by selecting the annual maximum, annual deductible, and reimbursement percentage that fit your budget and needs. Shop for uber healthy food, treats, supplements, dental and breath sprays, ear care, and fun accessories for your furry loved ones: TRUDOG is a shopping experience worth the visit. Whistle GPS Pet Tracker attaches to your pet’s collar, allowing you to locate your pet in minutes and track their daily activity on your phone. PupJoy Boxes are filled with natural and organic treats, chews, toys and accessories from artisan brands, all hand selected to your needs and delivered to your door! "Maks' Pup Joy box came today and was a hit. He got the interactive gingerbread house with 3 gingerbread men inside, that he has to work to get out (he LOVES figure-it-out toys). Then, he got a Santa, gingerbread man, and koala bear...all of which are size appropriate. Other “joy boxes” I’ve ordered elsewhere did not offer customization. Toys they sent were too big and they have no content customization (could not get a box without treats which was a waste of money for us, as Maks has gastritis). Fitbark is a dog activity and sleep monitor to help you gauge physical activity and rest levels 24/7. This collar device will help you set exercise goals and share the data with your Veterinarian. Affiliate Marketing Disclosure: Doolittle’s Doghouse receives a small commission –“lunch money”- from the companies whose products we endorse. We only recommend select products that we feel are beneficial for your pets health and wellness. While there is no additional cost to you, should you choose to purchase from one of these outstanding pet-care companies, it helps us keep our boarding rates as low as they are.